Cream Blusher is another option of a powder blusher. What is the difference? Powder Blush tends to fade faster compare to cream/liquid type blush. Most Cream Blush I found in the market is "too pigmented" or dry on the skin that causes patchiness or hard to blend mark on the cheek. I found a drugstore holy grail find which are these IN2IT Cream Blusher. They are affordable and easy to work with. Comes in 5 different shades to choose from. The Cream Blusher has formulated with Aloe Vera & Vitamin E. It is very hydrating on the skin too, & it makes your pores less visible. 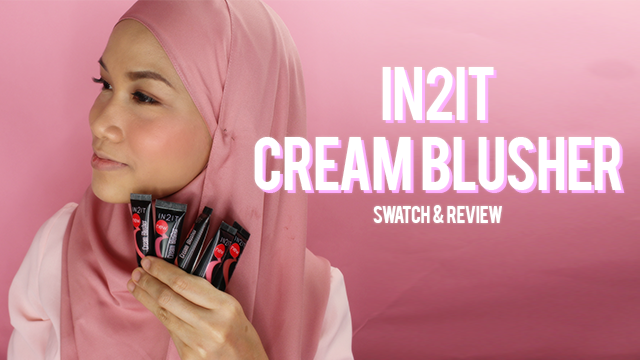 Watch my video below to see the live swatches and demo on how to use the Cream Blusher! The Cream Blusher comes in a squeeze tube with a pointed tip opening. The texture of the Cream Blusher is creamy and highly pigmented but also easy to blend. Does not dry too fast where it gives you time to blend it. It lasts pretty long as after a while it leaves a stain on your cheeks but still easy to removes with a proper makeup remover. IN2IT Cream Blusher, from left to right : 01 Carnation, 02 Coral, 03 Blush, 04 Garnet, & 05 Tulip. Here is the full swatch picture of all 5 Cream Blusher shades that you can choose from or why not have them all. 01 Carnation is a true baby pink shade, 02 Coral is a warm coral shade, 03 Blush is a rose pink shade, 04 Garnet is a warm red with brown undertone shade, & lastly, 05 Tulip is a baby soft peach shade. My favorite is 05 Tulip & 03 Blush! 1. Squeeze a small amount at the back of your hand. 2. Dor 3 angle on your cheek area. 3. You can use your finger or sponge to apply. I prefer sponge as it blends nicer. 4. Bounce the sponge or lift upwards (if you are using your finger) in dap motion until all blend well on to the cheek area. These Cream Blushers retail for RM16.90 each and available at all participating Watsons outlet nationwide.